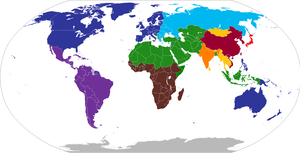 Samuel P. Huntington argues in the Clash of Civilizations theory that after the Cold War, cultural differences between the West and other civilizations will be the main source of conflicts. Anti-Western sentiment, also known as Anti-Atlanticism, or Westenophobia (is from a Germanic word passed into some Romance languages and Greek φόβος, phobos, “fear”) refers to broad opposition, bias, or hostility to the people, Western Culture, Western Values (Western Philosophy), or policies of the Western World. In many modern cases, anti-western sentiment is fuelled by Anti-imperialism, particularly against countries that are "all are deemed guilty for the colonial crimes of the past and present" such as Germany, Britain and the Dutch. Anti-Western sentiment occurs in many countries, even from the West itself – especially European countries. Broad anti-Western sentiment also exists in the Muslim world against Europeans and the United States. The hatred against the United States stems from their support for Israel, the seizure of Iraq and the numerous sanctions on Iran. After the end of the Cold War, Samuel P. Huntington argued that international conflict over economic ideology will be replaced with conflict over cultural differences. He argues that economic and political regionalism will increasingly shift non-Western countries towards geopolitical engagement with countries that share their values. Huntington argues that the Islamic world experiencing a population explosion at the same time as a growth in Islamic fanaticism, leading to rejection of Westernization. Africa is often the posterchild for post-colonial societal collapse where retreating empires and corporate wars for resources have left behind nations unable to maintain their current trajectory of development or even their current state of affairs. Many conflicts currently playing out in Africa, similar to the Middle East, are often blamed on the United Kingdom, France, Italy, Belgium, Portugal, Germany, and the United States for arbitrary borders drawn with little regard to the ethnicity, tribal affiliation, and religions of the original inhabitants. Anti-Western sentiment in China has been increasing since the early 1990s, particularly amongst the Chinese youth. Notable incidents which have resulted in a significant anti-Western backlash have included the 1999 NATO bombing of the Chinese embassy in Belgrade, the 2008 demonstrations during the Olympic torch relay and alleged Western media bias, especially in relation to the March 2008 Tibet riots. Whilst available public opinion polls show that the Chinese hold generally favourable views towards the United States, there remains suspicion over the West's motives towards China stemming largely from historical experiences and specifically the 'century of humiliation'. These suspicions have been increased by the Communist Party's "Patriotic Education Campaign". There is a history of criticism of the so-called West within the history of thinking within the culture of Japan. Lee Kuan Yew, the former Prime Minister of Singapore, argues that East Asian countries such as China, Japan, Korea and Vietnam should be based on "Asian values". Countries such as the Four Asian Tigers should aspire to have Western-style standards of living, but without accepting liberal democratic social institutions and principles. In Amsterdam's secondary schools, about half the students of Moroccan descent do not identify with the Netherlands: they see their identity as 'Muslim', and regularly express anti-Western views but, nevertheless, do not want to return to their ancestral homeland. Russian President Vladimir Putin with religious leaders of Russia, 2001. Putin has promoted religious traditionalism and the rejection of some Western liberal principles, like toleration of homosexuality. After the Cold War, a number of politicians in the Russian Federation have supported an explicit promotion of Russian Orthodox traditionalism, and a rejection of Western liberalism. Some ultra-nationalist politicians, such as Vladimir Zhirinovsky, an anti-communist, express the most anti-Western sentiment. Vladimir Putin has promoted explicitly conservative policies in social, cultural and political matters, both at home and abroad. Putin has attacked globalism and neo-liberalism, and promoted new think tanks that stress Russian nationalism, the restoration of Russia's historical greatness, and systematic opposition to liberal ideas and policies. Putin has collaborated closely with the Russian Orthodox Church. Patriarch Kirill of Moscow, head of the Church, endorsed his election in 2012 stating Putin's terms were like "a miracle of God." The Russian Orthodox Church sometimes is host to groups that promote nationalist and anti-Western tendencies. The Russian government has restricted foreign funding of some pro-liberal Non Governmental Organizations. Pro-Russian activists in the former Soviet Union frequently equate the West with homosexuality and the gay agenda, and Russian gay propaganda law was welcomed by nationalist and religious political figures in Russia as a bulwark against Western influence. The Yarovaya Law prohibits evangelism by religious minorities, which was used to ban the U.S.-based Jehovah's Witnesses. Terrorist groups Al-Qaeda and ISIS are both anti-western, and promote terrorism in Western countries. During the Ottoman period of Turkey a tradition of anti-Western idea commenced development. ^ a b Huntington, Samuel P. (1 June 1993). "The Clash of Civilizations?". Foreign Affairs. ^ "Definition of ANTI-WESTERN". www.merriam-webster.com. Retrieved 30 November 2018. ^ "anti-Western | Definition of anti-Western in English by Oxford Dictionaries". Oxford Dictionaries | English. Retrieved 30 November 2018. ^ a b c Abdul-Ahad, Ghaith (14 September 2012). "Anti-western violence gripping the Arab world has little to do with a film". the Guardian. Retrieved 22 August 2018. ^ "Anti-western sentiment flourishes in China". ABC. 24 April 2008. Retrieved 8 June 2009. ^ Peter Hays Gries (July 2001). "Tears of Rage: Chinese Nationalist Reactions to the Belgrade Embassy Bombing". The China Journal. Canberra, Australia: Contemporary China Center, Australian National University. 46 (46): 25–43. doi:10.2307/3182306. ISSN 1324-9347. JSTOR 3182306. OCLC 41170782. ^ "Protests against 'Tibet independence' erupt in cities". China Daily. 19 April 2008. Retrieved 23 May 2009. ^ "Looking past Western media bias against China". China Daily. 28 February 2008. Retrieved 7 June 2009. ^ Bristow, Michael (25 March 2008). "China criticises Western media". BBC News. Retrieved 7 June 2009. ^ a b "Hope and Fear: Full report of C-100's Survey on American and Chinese Attitudes Toward Each Other" (PDF). Committee of 100 with assistance from Zogby International and Horizon Research Consultancy Group. 2008. Archived from the original (PDF) on 9 November 2008. Retrieved 8 June 2009. ^ Peter Ford (17 April 2008). "Chinese vent anti-Western fury online". The Christian Science Monitor. Retrieved 8 June 2009. ^ "Human Rights and Asian Values | Carnegie Council for Ethics in International Affairs". Retrieved 22 August 2018. ^ City of Amsterdam policy document, February 2006. Wij Amsterdammers II: investeren in mensen en grenzen. ^ Darmaros, Marina (23 April 2012). "The Russian Orthodox Church won't be silent". Russia Beyond The Headlines. Retrieved 28 February 2017. ^ Aleksandr Verkhovsky, "The role of the Russian Orthodox Church in nationalist, xenophobic and antiwestern tendencies in Russia today: Not nationalism, but fundamentalism." Religion, State & Society 304 (2002): 333-345. ^ "Anne Applebaum: Russia's anti-Western ideology has global consequences". ^ "27 Nobel laureates urge Putin to repeal gay propaganda law". Russia Today. 14 January 2014. Retrieved 12 February 2014. ^ "Young Arabs and Fear of Westernization - The Globalist". The Globalist. 17 August 2003. Retrieved 30 November 2018. This page was last edited on 2 April 2019, at 15:18 (UTC).